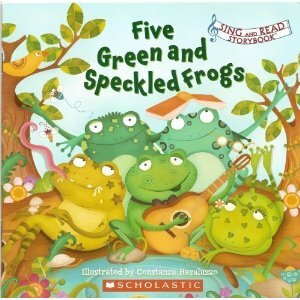 My youngest discovered a new song this week, 5 Green and Speckled Frogs. I sang it to him once and he was hooked. I pulled out the book version of 5 Green and Speckled Frogs and he has been carrying it back and forth to school every day. And yesterday, I found both my boys huddled together, my eldest reading the story and my youngest listening intently. I knew it was time for the next step…. 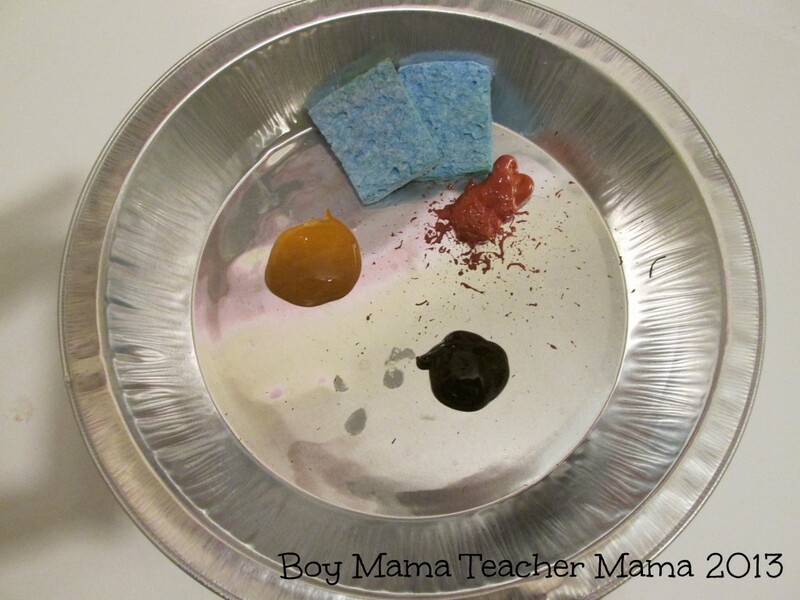 Place paints on a plate or in a dish. Cut a sponge into 4 small pieces and set two aside. Roll a piece of poster board into a log shape (or you can use a paper towel roll). 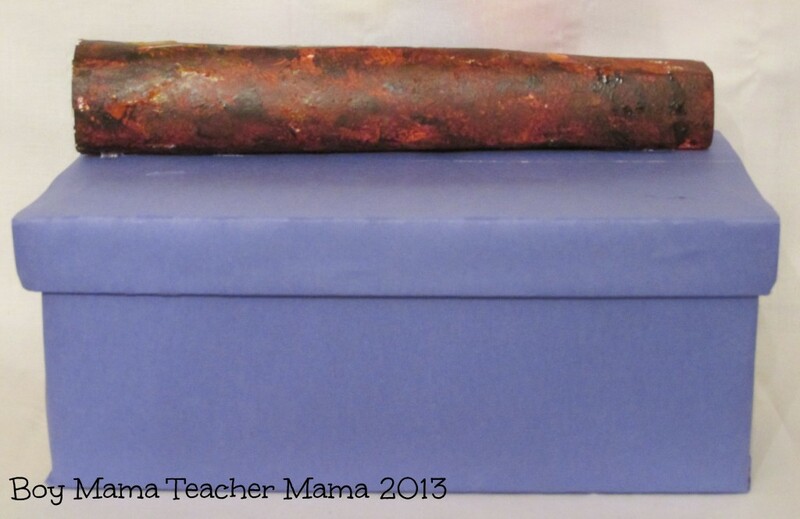 Use the sponges to color the log so it looks “speckled.” Allow to dry. While the log is drying, print out the frogs from Picklebums. 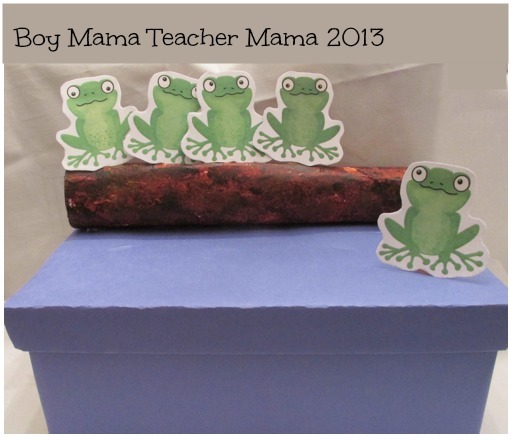 Glue the frogs onto card stock or any other thicker paper. 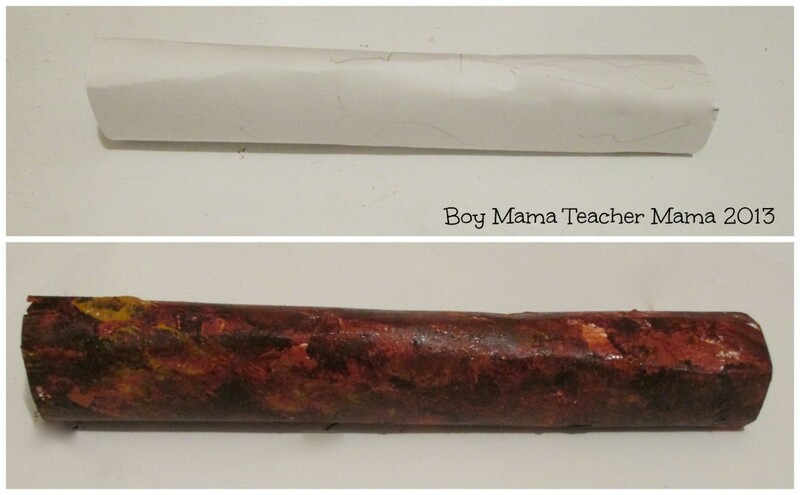 Cut the frogs out and glue them to the popsicle stick halves with hot glue. 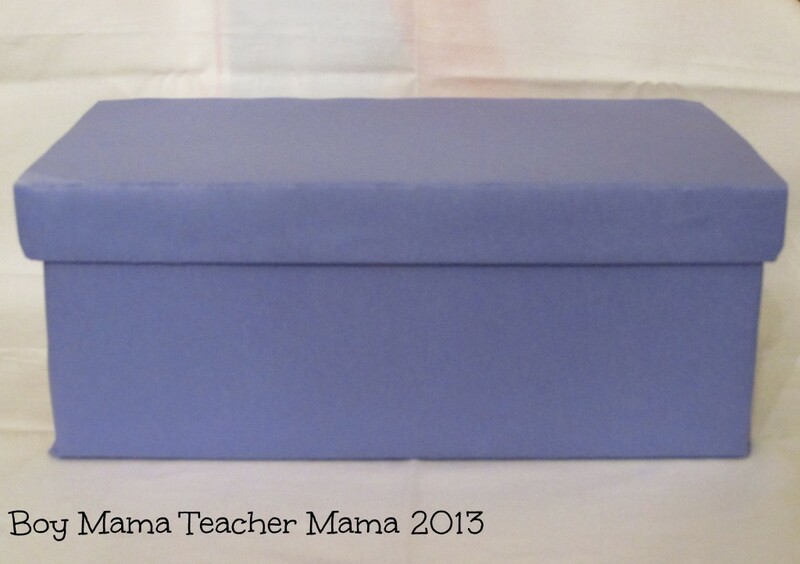 Then cover the top and front of the shoe box with blue construction paper. I did not cover the sides or back of the box, but you certainly can. Then, using an exacto knife, cut five slits in the “pool” for the frogs. Do not make your slits too far back or they will be under the log! 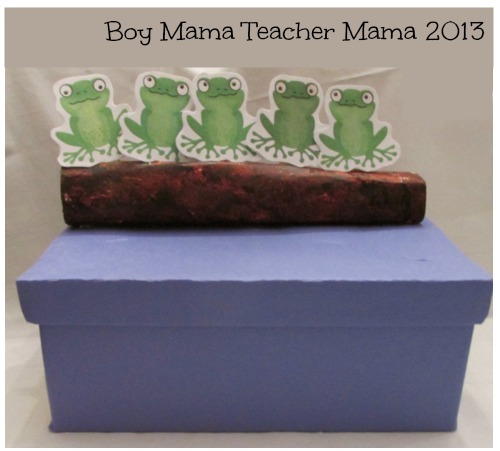 When the log is dry, cut 5 slits in the log for the frogs and hot glue it to the box as shown below. 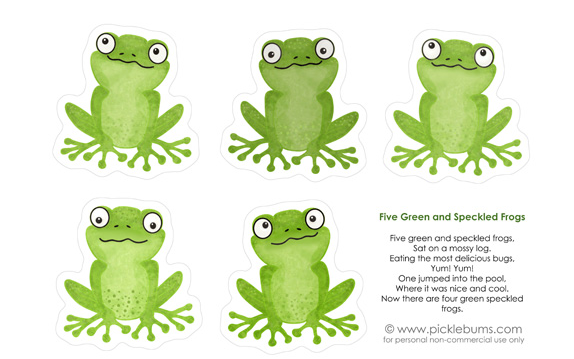 Add the frogs and your interactive 5 Green and Speckled Frogs Game is done and ready for some fun! 5 green and speckled frogs sat on a speckled log eating the most delicious bugs. Yum! Yum! 1 jumped into the pool where it was nice and cool and now there are 4 green speckled frogs. 4 green and speckled frogs sat on a speckled log eating the most delicious bugs. Yum! Yum! 1 jumped into the pool where it was nice and cool and now there are 3 green speckled frogs. Continue until there are no more speckled frogs on the speckled log! 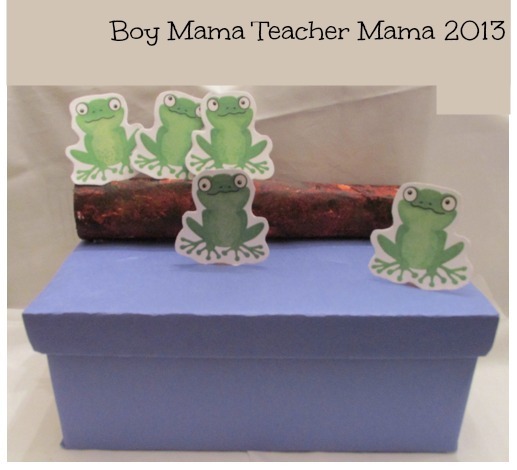 Fun frog activity! I love that song too. Thanks for sharing at Mom’s Library! 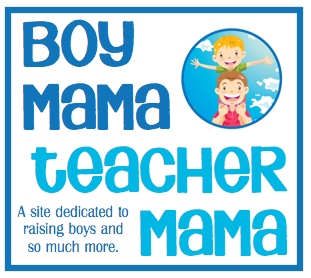 A fun activity, I look forward to using it when my grandchildren come to visit. Thanks for posting. Love it! Even though the boy is 7, I’m sure he’ll love this! I’ll let you know when I post the finished product!